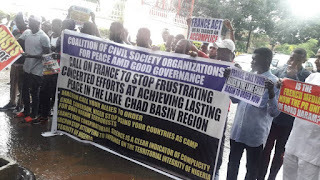 The Coalition of Civil Society Organisation for Peace and Good Governannce has berated the French Government over its non-committal to Lake Chad Basin Security. third party countries are the new problem in the fight to root out the last remnants of Boko Haram fighters in Borno state and environ – the entire Lake Chad Basin bordering Nigeria. The group who defied the heavy downpour in Abuja to besiege the Embassy in their hundreds said these new recruits trained by French speaking mercenaries have been uncovered to be behind the new attempts to make it appear Boko Haram has bounced back. Ogwuche said, "We said “new” because this information is resurfacing after some people earlier dismissed it as conspiracy theory in the past. But these recent reports now indicate that the activities of these third party countries must have been on possibly before the birth of Boko Haram as a terrorist group. "Countries that have been identified as stalling the final demise of Boko Haram are France and its former colonies: Cameroun, Chad and Niger. France reportedly has long term economic and geo-politics interest that has made it an active sponsor of the carnage that was visited on the region by Boko Haram. It has done this covertly and overtly. "On the one front, France’s tacit support for jihadis in the Middle East and North Africa, which often involve the funnelling of weapons to these terrorists in the guise of opposition fighters has ensured that Boko Haram continues to get steady supplies of arms and ammunitions. This explains why the terrorists possess firepower that make it unnecessarily challenging for the military to flush out their remnant with the ease expected at the onset. "With the way these jihadis turn round to find their way into Paris and carry out attacks, the expectations are that France would have by now initiated moves to support in defeating terrorism abroad but it seems decision makers in that country are resolute on embracing fire to their bosoms. It is a matter of time before the fleeing Boko Haram terrorists enter France with Cameroonian, Chadian and Nigerien passports and ply their trade on the streets of France. We hope that wen that time comes Nigeria will not be accused of being a nursery for hatching terrorists. "France has indirectly aided Boko Haram by failing to task its allies on Nigeria’s borders – Chad, Cameroun and Niger to take action in the direction of getting rid of what is left of the Boko Haram fighters. What we have learnt is that these fighters use these countries as their new bases from where they travel to launch attacks in Nigeria and retreat back to. "The accessional tokenism of killing a couple terrorists that go to the extreme in these countries is meant to conflate the world and create the impression that they are fully in support of Nigeria’s war on terrorism. If they were committed to not allowing Boko Haram use their lands as bases they would have regularly return the corpses of any fighters that retreat into their countries. "This attitude from these countries is in spite of the existing cooperation that created the Multinational Joint Military Task Force, which today exists merely in media reports as only the Nigerian military is doing the heavy lifting. The entire West and Central Africa would have been in serious trouble by now if not for the dedication of the Nigerian military. That the Nigerian military made the progress it made against Boko Haram in the face of these concerted sabotage is something that it should be commended for globally as a shining example of how a country’s military can surmount international obstacles to defeat the enemy. "What has happened instead is that the Nigerian military is being targeted for negative reporting while Boko Haram terrorists get positive ratings, sadly, in a charge led by French media, which other international media are constrained to syndicate so that they would not be seen as missing part of the action. It is curious that pro-French newswires are using their reports to lie about Boko Haram being the superior force, something unheard of in reporting terrorists versus sovereign states. We had wondered in recent weeks what the intent of such reports could be but we no longer have to ponder as there has been a spike in recruiting new fighters for Boko Haram from among neighbouring francophone ethnic groups that are congruous with Nigerian ethnicities. "These new recruits trained by French speaking mercenaries have been uncovered to be behind the new attempts to make it appear Boko Haram has bounced back. We know these named countries will again dismiss these accusations without marshalling facts to support their denials. We therefore make it categorically clear through this protest that denial without hard facts to corroborate is unacceptable at this point. What will work is for France and its allies – Cameroun, Chad and Niger to show commitment in real terms to prove that they are not shoring up Boko Haram to continue committing crimes against humanity.